Fernanda Gianesella Bertolaccini wants her voice to be heard. An activist in her native Brazil, Bertolaccini focuses on how private companies comply with voluntary sustainability standards and how they are held accountable for them. She also looks at the effect these regulations have on vulnerable populations. It is the focus of her Ph.D. dissertation at Brazil’s São Paulo University School of Law. Her Ph.D. program encourages students to enrich their knowledge abroad and allows them to earn two separate diplomas. She chose to do an LL.M. at Notre Dame Law School because the U.S. is in the forefront of sustainability regulations, and she was already familiar with the work of some professors at the University of Notre Dame. Bertolaccini used papers on international human rights law written by Douglass Cassel, a professor emeritus at Notre Dame Law School, in her previous work at the Center for Global Trade and Investment, a think tank at the Getulio Vargas Foundation in Brazil. She also used papers that the Rev. Oliver Williams, C.S.C., an associate professor of management at the Mendoza College of Business, wrote about social corporate responsibility. Fernanda Gianesella Bertolaccini, an LL.M. student at Notre Dame Law School, center, chats with her fellow students in the Law School’s Commons. Photos by Alicia Sachau/Notre Dame Law School. The LL.M. program is based at Notre Dame Law School, but students in the program are able to take advantage of other opportunities on campus. When she arrived at Notre Dame, Bertolaccini was thrilled to discover Diane Desierto, another scholar whom she had been following, was also at Notre Dame. Desierto, an associate professor of human rights law and global affairs, joined the Keough School of Global Affairs in August. Bertolaccini has taken two classes with Desierto, and the experience has been an enriching one. But her experience at the University goes deeper than academics, she said. Bertolaccini’s time at Notre Dame has helped her knit together her interests in activism and law. She hopes to continue the process through an internship with the United Nations Global Compact, which is an initiative that deals with educating and creating a culture of sustainability at all levels of private companies. She worked with the Global Compact indirectly in Brazil to translate one of its assessment tools that helps private companies assess their level of gender equality in the workplace. When she returns to Brazil, she knows these experiences will help to amplify her voice. 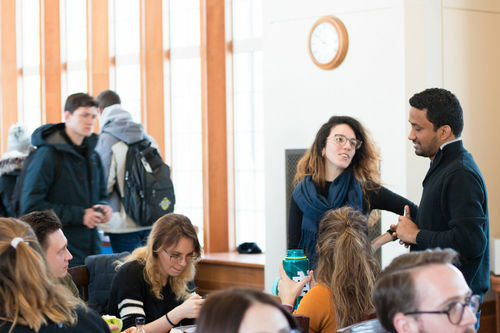 Originally published by Alice Culp at law.nd.edu on February 18, 2019.